According to modern cosmological models, the Universe began in a cataclysm event known as the Big Bang. This took place roughly 13.8 billion years ago, and was followed by a period of expansion and cooling. During that time, the first hydrogen atoms formed as protons and electrons combined and the fundamental forces of physics were born. Then, about 100 million years after the Big Bang, that the first stars and galaxies began to form. The formation of the first stars was also what allowed for the creation of heavier elements, and therefore the formation of planets and all life as we know it. However, until now, how and when this process took place has been largely theoretical since astronomers did not know where the oldest stars in our galaxy were to be found. But thanks to a new study by a team of Spanish astronomers, we may have just found the oldest star in the Milky Way! The study, titled “J0815+4729: A chemically primitive dwarf star in the Galactic Halo observed with Gran Telescopio Canarias“, recently appeared in The Astrophysical Journal Letters. Led by David S. Aguado of the Instituto de Astrofisica de Canarias (IAC), the team included members from the University of La Laguna and the Spanish National Research Council (CSIC). This star is located roughly 7,500 light years from the Sun, and was found in the halo of the Milky Way along the line of sight to the Lynx constellation. Known as J0815+4729, this star is still in its main sequence and has a low mass, (around 0.7 Solar Masses), though the research team estimates that it has a surface temperature that is about 400 degrees hotter – 6,215 K (5942 °C; 10,727 °F) compared to 5778 K (5505 °C; 9940 °F). For the sake of their study, the team was looking for a star that showed signs of being metal-poor, which would indicate that it has been in its main sequence for a very long time. The team first selected J0815+4729 from the Sloan Digital Sky Survey-III Baryon Oscillation Spectroscopic Survey (SDSS-III/BOSS) and then conducted follow-up spectroscopic investigations to determine its composition (and hence its age). This was done using the Intermediate dispersion Spectrograph and Imaging System (ISIS) at the William Herschel Telescope (WHT) and the Optical System for Imaging and low-intermediate-Resolution Integrated Spectroscopy (OSIRIS) at Gran Telescopio de Canarias (GTC), both of which are located at the Observatorio del Roque de los Muchachos on the island of La Palma. Consistent with what modern theory predicts, the star was found in the Galactic halo – the extended component of our galaxy that reaches beyond the galactic disk (the visible portion). It is in this region that the oldest and most metal-poor stars are believed to be found in galaxies, hence why the team was confident that a star dating back to the early Universe would be found here. Spectra obtained by both the ISIS and OSIRIS instruments confirmed that the star was poor in metals, indicating that J0815+4729 has only one-millionth of the calcium and iron that the Sun contains. In addition, the team also noticed that the star has a higher carbon content than our Sun, accounting for almost 15% percent of its solar abundance (i.e. the relative abundance of its elements). In the near future, the team predicts that next-generation spectrographs could allow for further research that would reveal more about the star’s chemical abundances. Such instruments include the HORS high-resolution spectrograph, which is presently in a trial phase on the Gran Telescopio Canarias (GTC). These future studies are sure to be a boon for astronomers and cosmologists. In addition to being a chance to study stars that formed when the Universe was still in its infancy, they could provide new insight into the early stages of the universe, the formation of the first stars, and the properties of the first supernovae. In other words, they would put us a step closer to know how the Universe as we know it formed and evolved. Eclipsing binary star systems are relatively common in our Universe. To the casual observer, these systems look like a single star, but are actually composed of two stars orbiting closely together. The study of these systems offers astronomers an opportunity to directly measure the fundamental properties (i.e. the masses and radii) of these systems respective stellar components. Recently, a team of Brazilian astronomers observed a rare sight in the Milky Way – an eclipsing binary composed of a white dwarf and a low-mass brown dwarf. Even more unusual was the fact that the white dwarf’s life cycle appeared to have been prematurely cut short by its brown dwarf companion, which caused its early death by slowly siphoning off material and “starving” it to death. The study which detailed their findings, titled “HS 2231+2441: an HW Vir system composed by a low-mass white dwarf and a brown dwarf“, was recently published the Monthly Notices of the Royal Astronomical Society. The team was led by Leonardo Andrade de Almeida, a postdoctoral fellow from the University of São Paolo’s Institute of Astronomy, Geophysics, and Atmospheric Sciences (IAG-USP), along with members from the National Institute for Space Research (MCTIC), and the State University of Feira de Santana. For the sake of their study, the team conducted observations of a binary star system between 2005 and 2013 using the Pico dos Dias Observatory in Brazil. This data was then combined with information from the William Herschel Telescope, which is located in the Observatorio del Roque de los Muchachos on the island of La Palma. This system, known as of HS 2231+2441, consists of a white dwarf star and a brown dwarf companion. White dwarfs, which are the final stage of intermediate or low-mass stars, are essentially what is left after a star has exhausted its hydrogen and helium fuel and blown off its outer layers. A brown dwarf, on the other hand, is a substellar object that has a mass which places it between that of a star and a planet. Finding a binary system consisting of both objects together in the same system is something astronomers don’t see everyday. 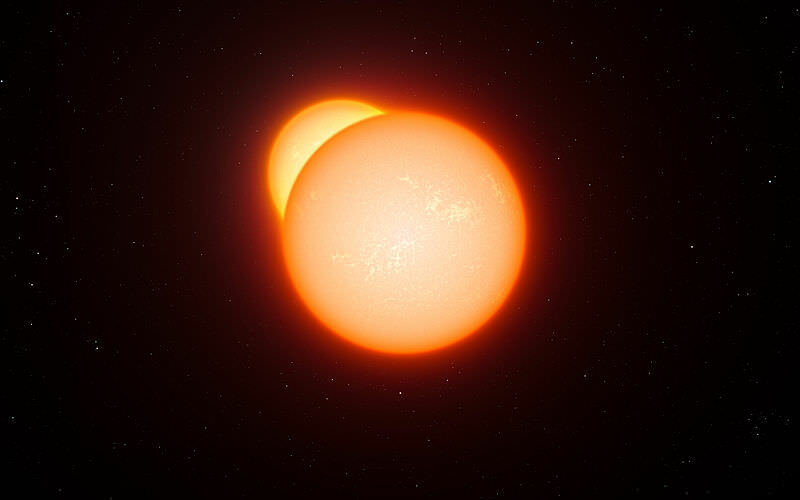 This particular binary pair consists of a white dwarf that is between twenty to thirty percent the Sun’s mass – 28,500 K (28,227 °C; 50,840 °F) – while the brown dwarf is roughly 34-36 times that of Jupiter. This makes HS 2231+2441 the least massive eclipsing binary system studied to date. This artist’s impression shows an eclipsing binary star system. Credit: ESO/L. Calçada. In the past, the primary (the white dwarf) was a normal star that evolved faster than its companion since it was more massive. Once it exhausted its hydrogen fuel, its formed a helium-burning core. At this point, the star was on its way to becoming a red giant, which is what happens when Sun-like stars exit their main sequence phase. This would have been characterized by a massive expansion, with its diameter exceeding 150 million km (93.2 million mi). At this point, Almeida and his colleagues concluded that it began interacting gravitationally with its secondary (the brown dwarf). Meanwhile, the brown dwarf began to be attracted and engulfed by the primary’s atmosphere (i.e. its envelop), which caused it it lose orbital angular momentum. Eventually, the powerful force of attraction exceeded the gravitational force keeping the envelop anchored to its star. This situation is similar to what astronomers noticed this past summer while studying the binary star system known as WD 1202-024. Here too, a brown dwarf companion was discovered orbiting a white dwarf primary. What’s more, the team responsible for the discovery indicated that the brown dwarf was likely pulled closer to the white dwarf once it entered its Red Giant Branch (RGB) phase. At this point, the brown dwarf stripped the primary of its atmosphere, exposing the white dwarf remnant core. Similarly, the interaction of the primary with a brown dwarf companion caused premature stellar death. The fact that two such discoveries have happened within a short period of time is quite fortuitous. Considering the age of the Universe (which is roughly 13.8 billion years old), dead objects can only be formed in binary systems. In the Milky Way alone, about 50% of low-mass stars exist as part of a binary system while high mass stars exist almost exclusively in binary pairs. In these cases, roughly three-quarters will interact in some way with a companion – exchanging mass, accelerating their rotations, and eventually en merging. It has only been in recent years that low-mass white dwarf stars were discovered. Finding binary systems where they coexist with brown dwarfs – essentially, failed stars – is another rarity. But with every new discovery, the opportunities to study the range of possibilities in our Universe increases.